I really liked this bag clip, before it snapped and weakened at the hinge part. It held everything together but I recommend getting two clips as it slip n slides on its own. This item is amazing! I could not live without these clips now as they make shopping with the wee one so much easier. I would highly recommend these for any mums to purchase as they are very handy. This gadget is amazing really helpful when there is not enough space in the storage under the pram. It’s in my top ten best buys since having my child! If you have too many bags as it is, this will help in so many ways!! Definitely recommend! Too much weight can make a pram tip. Won’t go anywhere without my mummy clip, there so handy to pile the shopping on and leave your hands free to push your pram. Useful item to help carry bags on the buggy. Lasts well and is strong. I used this to also attach my nephews reins and this worked extremely well allowing me to have my hands free to hold the buggy. Tried few different ones before got this one, wouldn't swap for any different now. Love it. Recommended to friends and would definitely recommend to everyone else. Fits a few good sized/weighted bags on easily, can hang to one side or in the middle. Essential for those shopping trips! Buggy clip is usefull when your a parent that walks alot or uses the buggy alot . Very strong and realible. Easy to use and to clip on to the buggy. I purchased this bag clip as I do not drive and walk my baby in to town frequently. I needed a clip so that I could comfortably walk home (20 minutes) with bags. It holds a good amount of weight and has been hugely convenient. Loved using this on my pushchair. It saved me having to carry the bags in my hands. Allowing me to push the pushchair comfortably. I've had one for 4 years and using it again. Easy to use. Large enough it can hold 2/3 bags of shopping. This is one of the best buggy clips on the market. They’re strong and durable you can hang lots of shopping bags into it. I even use it to hold a small shopping basket when doing a smaller shop, even better if you have two of them. Then it holds the basket perfectly! It’s great! Highly recommended! Foam can easily break off especially with teething children around! 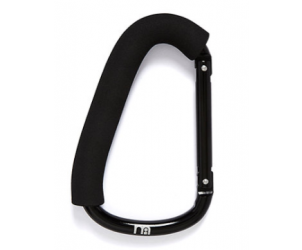 Great clip for hanging bags on the pushchair or even just to keep bags together. I own 4! They are so helpful and handy and easy to carry around in a bag. They are easy to use and can hold quite a lot. I've had no issues unless you count a child using it as a teether an issue! Definitely recommend to have with a pushchair particularly with shopping. Amazing, handy when out and about with the push chair, easy and doesn’t hurt your hand if your carrying it with bags on. Had mine around 3 years and still going strong, definitely would recommend for any first time parent as a must. 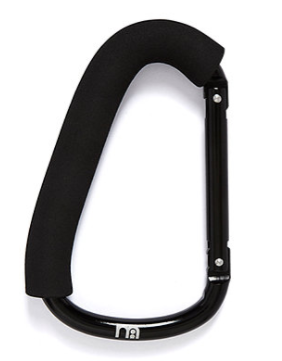 The Mothercare Large buggy clip can be attached to the handlebar of your buggy, forming a hanger for your bag.